This hike begins where Forest Road 6300.057 leaves FR 63. Due to a washout this road to the trail head is unusable, so it has been bermed right at the beginning. Therefore there is only room for 1 vehicle to park at the existing trail head. The trail follows the road downhill a bit until it crosses the washed out area where the road used to cross a small stream. This stream could be difficult to cross if the water is high. On the summer day I crossed the stream, as you can see in the photos, the crossing was very easy. After the stream, the trail begins to slowly climb until you come to the sign announcing Trail #284 to Purcell Mtn. Now things get serious. The trail becomes steeper and steeper as you begin the climb up Purcell Mountain. In season you will begin to enjoy a large variety of wildflowers. The trail has many switchbacks which make the steep climb quite tolerable. At about 2 miles you will break out into open areas with fantastic views. 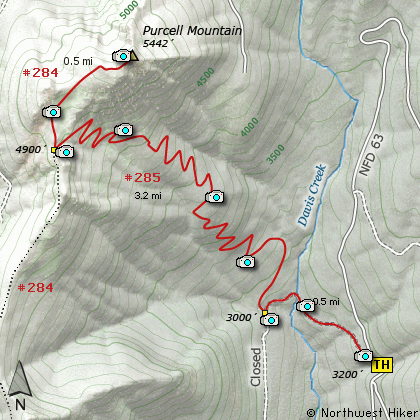 At 2.5 miles you will intersect the Purcell Mtn Trail #284. 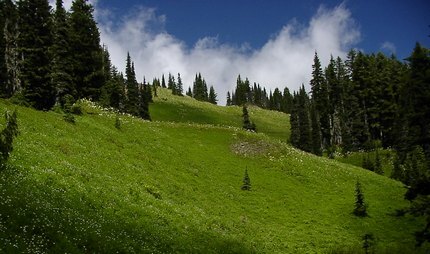 Now you follow the ridge line to the summit through fields of wildflowers in season. The views from the summit are worth every bead of sweat it took to get there! Travel east on US Hwy 12 for about 48 miles to Randle. From Randle continue east on US Hwy 12 for about 5.9 miles and you will come to David Creek Road on your left. Bear left onto Davis Creek road and follow it east for about 1 mile and you will come to the junction of Forest Road 63. Turn left (north and uphill) onto FR63 and follow it for about 4.6 miles. The trailhead for this hike begins on an old abandoned road near a steep left curve in FR63.